Our office carries several product lines that promote healthy skin and help to reverse sun damage. 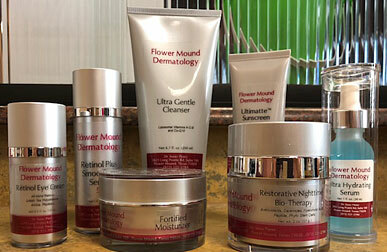 The Flower Mound Dermatology® private label items are available for all skin types. We have cleansers, toners, moisturizers, eye creams and acne products. 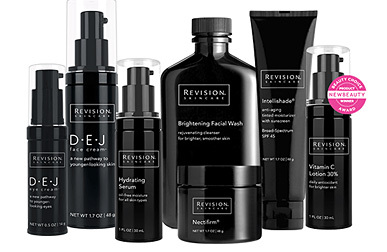 It is a complete skincare line for acne, anti-aging, or just good skincare. Men, women and teens can benefit from a customized product package or a single item. A complimentary consultation with our aesthetician is most helpful to determine the patient’s needs. 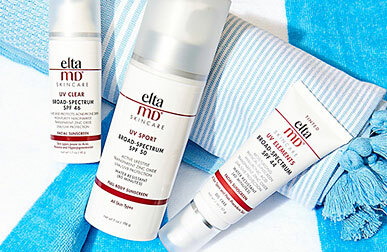 EltaMD sun care and skin care products are formulated for every skin type, lifestyle and special need. They are committed to providing physicians and their patients innovative products that help develop and maintain great skin for life. EltaMD sunscreens help prevent sunburn and decrease the risk of skin cancer and early skin aging caused by the sun, when used with other sun protection measures. EltaMD skincare product line includes deep yet gentle cleansers, intense moisturizers and innovative formulas that repair the visible signs of aging. We stock Teamine® Eye Complex from Revision, but can special order any other products from them. Since there is no single cause of dark circles, Teamine® Eye Complex was formulated to effectively address the appearance of dark circles in multiple ways. It will visibly diminish the appearance of dark under-eye circles, smooth the look of fine lines and wrinkles and brighten your skin while providing antioxidant benefits. 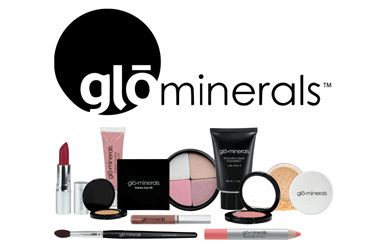 We stock select items in the cosmetic line from GloMinerals, but can special order anything. The micronized mineral bases combine powerful antioxidants and UV protection in a delivery system that provides flawless coverage. It’s skin nurturing makeup for beauty with a higher purpose. GloMinerals is safe for coverage and UV protection following Microdermabrasion, chemical peel, cosmetic surgery and waxing. GloMinerals uses only superior pharmaceutical-grade vitamins and minerals. The base formulations contain no perfumes or chemical dyes and all are suitable for even the most sensitive skin types and conditions. These products are non-comedogenic so skin can breathe, which helps inhibit the potential for bacteria to become trapped in pores.